Change is possible and it doesn’t have to be a knockdown slugfest. Patience and kindness have been scientifically proven to extend the stamina of our woefully out-muscled willpower. Tiny steps, fast wins and environmental tweaks can make a seemingly impossible change happen almost painlessly. Most of us, who have tried to cut back on spending, either to pay off debt or increase our savings, think we have a money problem. We don’t. We have a behavior problem. Our spending habits are based on the same neurological loop that is at the core of all habits. We have been generously rewarded hundreds or thousands of times for the very behavior that we now need to change. That fact, all by itself, will make long-term change hard unless we carefully plan the change using everything we know about habits and behavior. No matter how smart or how disciplined we think we are, none of us can easily force ourselves to do what we know we should do long-term, if it is contrary to our established habits. 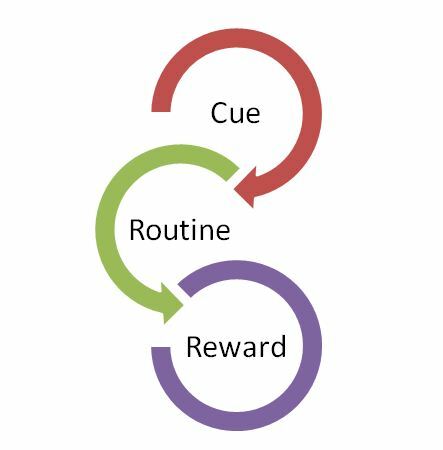 One great way to change habits is to leave the cue and reward in place but change the routine. Let’s say you normally head for the corner pub on Friday evening after work to meet a friend. A drink and an appetizer later you’ve easily spent $20 not to mention a ton of empty calories. The cue is 5 o’clock on Friday; the reward is the relaxing social time with a friend. If we change the routine from meeting at the pub to meeting at the park for a stroll, leaving both the cue and the reward in place, this habit will be easier to change. The challenge is to carefully and mindfully dissect your problem behaviors in order to determine what the cue, the routine and the reward truly are and then finding a replacement routine. Another great strategy that you must employ if you want to painlessly produce big behavior changes is teeny tiny steps. As a Dave Ramsey trained coach, I fully endorse the use of Ramsey 7 baby steps but most of those baby steps are huge giant leaps compared to the teeny tiny steps I’m referring to. Much of the magic of Ramsey’s plan is found in Step 2, the debt snowball. The debt snowball for most families does use tiny steps allowing for some fast wins and helping change behavior. But what if you have no small debts? I see this problem frequently. If the very smallest debt you have is going to take seemingly forever to pay off, it is easy to become discouraged and quit. We must find a teeny tiny step that you can successfully accomplish. Maybe we start with just tracking your spending using Mint.com No shame, no blame, no changes required, let’s just see where we are. Or maybe we can start with no restaurant spending for lunch for today? Can you do that, not eat out for lunch, just for today? It absolutely does not matter that neither of these behaviors will pay down that huge debt, it only matters that you can and will do them. With patience, we can build a staircase of teeny tiny steps that will lead you to your goal. For my attention challenged or just plain busy friends, if you don’t have time to read this post in its entirely then skip down to the bottom and do the 3 Actions steps. Ask yourself; are you better off than you were four years ago? Some 32 years ago, then presidential candidate Ronald Regan asked that question of American Voters and then walked away with the election. Clearly, many felt they were indeed worse off than they had been just four years earlier. What if we ask the same question of your family today? If you really want to have control over your life, you have to start believing that you have the power to shape your own future. Unlike Regan, I’m asking about your very personal economy. We all know that both our national and the global economies have been struggling. High unemployment, shaky markets and the housing crash have hurt many families; however other families have fared remarkably well. Still others took a big hit but have since turned things around and are well on the road to recovery. While there is no denying that the world economy can and probably does affect your personal finances, your behavior affects them more. Regularly tracking your overall financial health is one of the key habits you can develop to insure a positive answer to the “are we better off” question. One fairly easy, reliable method for measuring your financial position over time is to periodically compute your net worth. We track ours once a month. Mint.com does a good job of tracking most of our accounts but our investment accounts don’t report, so we do our monthly net worth calculation in excel. Others find that some other number makes a better yardstick. JD Roth over at Get Rich Slowly found that back in 2008, focusing on the one number he was trying to affect at the time (i.e. debt and then savings) was easier and more helpful then tracking his net worth; Why I don’t Track My Net Worth. I think in the early stages of wealth building, this is a perfectly acceptable alternative. The important thing here is to actually do it. Pick some indicator of your progress with money and track it consistently. One of the issues that stopped JD from calculating his net worth was the indecision of how to value the house. We allow Zillow through Mint to value the house. I don’t think Zillow does a great job of determining the actual fair market value of our home, but I do think it tracks fluctuations in the local market very well. For me, the actual number is not nearly as important as the trend. This same thinking applies to our net worth number. It’s the long-term trend of that number that really matters to me; not the actual number on any given day. When you are on baby step 2 (paying off all your debt except the house) changes in your net worth are hugely significant. Each tiny increase is evidence of your discipline and hard work. 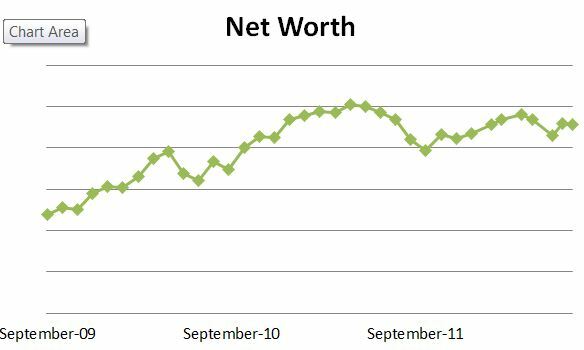 Make sure you graph your net worth month to month and put it where you can see it easily. You might have started with a negative net worth but just watching the line move in the right direction is validation that you are doing the right thing. Baby steps 3, 4 and 5 are all about actively saving (1st an emergency fund, then 15% of your income towards retirement plus saving for the kids college) and in baby step six you are really going to be pounding down that mortgage debt. These actions will almost all of the time produce steady upticks in your net worth number. Nonetheless, as the percentage of your assets held in investments increases, it is not usual to have a bad market month that really kicks your net worth in the teeth or a great month that starts you thinking if your money can make that much in a month you don’t need to work. Remember your long view here, market and real estate losses (or gains) are not realized until you sell. Calmly, plot you net worth number for the month and move on. Month by month, year by year you will be not just collecting a record of your money behaviors and outcomes but you will be in real time alerting yourself to trends you can change to ensure the future you want for your family. Set an appointment with yourself monthly to calculate your net worth. I do mine the last day of each month. Use whatever means you have you have to remind yourself to complete this task. I use a Google calendar event with an email reminder. You might use an iPhone reminder or a note on your paper calendar. We all need an accountability partner to ensure it gets done. Enter the value of your assets and liabilities in a spreadsheet like this one. First, make a copy or download the spreadsheet then customize it so it clearly lists your assets- the House, the 1999 Toyota Camry, IRA etc. and your liabilities Chase Credit Card, Home Equity loan etc. DO NOT use an online calculator; you need to keep this data. I do list vehicles and my high value boat on our statement but not personal property (furniture, clothes, jewelry). If you have high-value jewelry or collectibles that are readily convertible to cash list them at their true current market value. Save your entries and plot your chart every month. Here’s mine. This summer, my tribe of young wakeboarders introduced me to a new term; “Fall of Shame”. They tell me it’s defined as just letting go of the rope and slowly and gently sinking after a run. So what’s so wrong with that I ask? The answer, it’s a wasted opportunity, proof you weren’t pushing to learn a new skill or perfect an old one, going easy instead of going hard. Wow, it’s no wonder I love these boys so much! We can’t push hard in all areas of our life all the time but we need to frequently and honestly re-assess where we are and what we are doing to move forward. When is the last time you took a course or read a book with express purpose of improving your job performance? If you are a student, are you challenging yourself with your class selection or looking for the easy A? Are you actively trying to grow your business and your influence; or are you coasting? What level of effort are you really investing in your goals? Even a 14 year old knows that life is richer for having chosen to endure the occasional stinging face plant over the peaceful “Fall of Shame”.